Materials: 14 K white gold with red gold inlay (the men's ring); 14K white gold and red gold with inlay of red gold (the women's ring); both interiors are of 14K warm yellow gold. *Shipping costs excluded, Dutch BTW included. NOTE: the above ring set can also be ordered in sterling silver. *Shipping costs and US and Canadian tax rates excluded. Traditionally, Anishinaabe people have always been aware of an existence in the cosmos that vibrates with a sacred, creative energy. The sum of this cosmological energy - or manidoo (‘spirit’) - is called Gichi-Manidoo: literally ‘Great Mystery’. This sacred existence the jeweler tried to express in these multicolor gold overlay wedding bands. 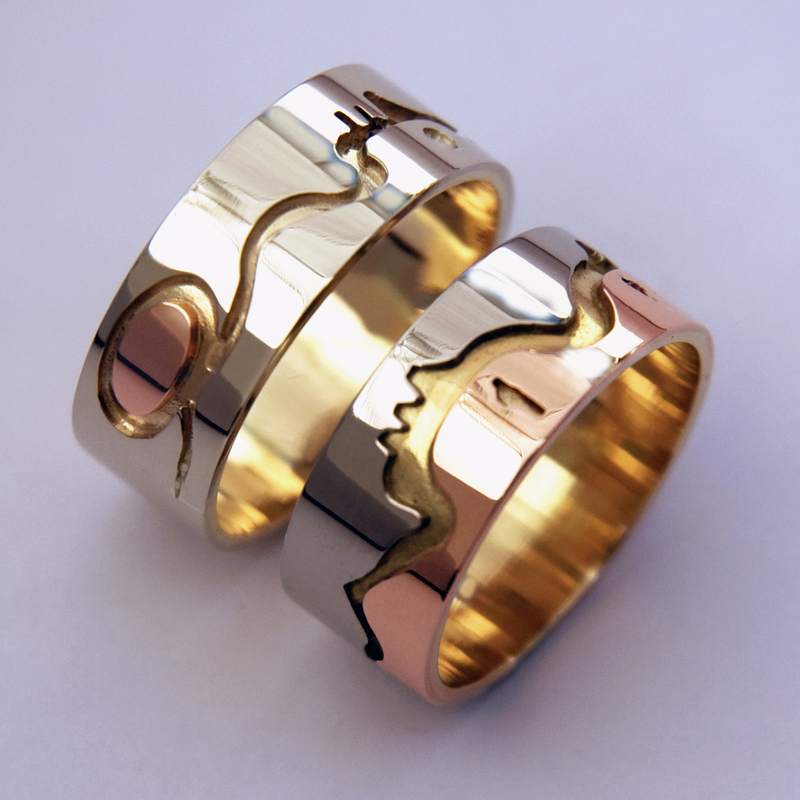 The graphic, waving yellow gold ‘earth line’ that runs across the surface of both wedding rings and which shows characteristics of the earth surface as well as the human body, symbolically connects the individual to the cosmos through a ‘sound’ that represents all aspects of Gichi-Manidoo. Anishinaabeg believe it is important that we re-connect our voice with Creation on a regular base; this is called aanji-nkweshkamong enweying shka-kimi-kweng. One side of the rings displays a heartbeat graphic symbolizing the heartbeat of our mother the Earth; on the other side - visible on the men´s ring - the jeweler constructed a stylized design of miinikaan – a seed of inlaid red gold representing the first sound of Creation in the morning. 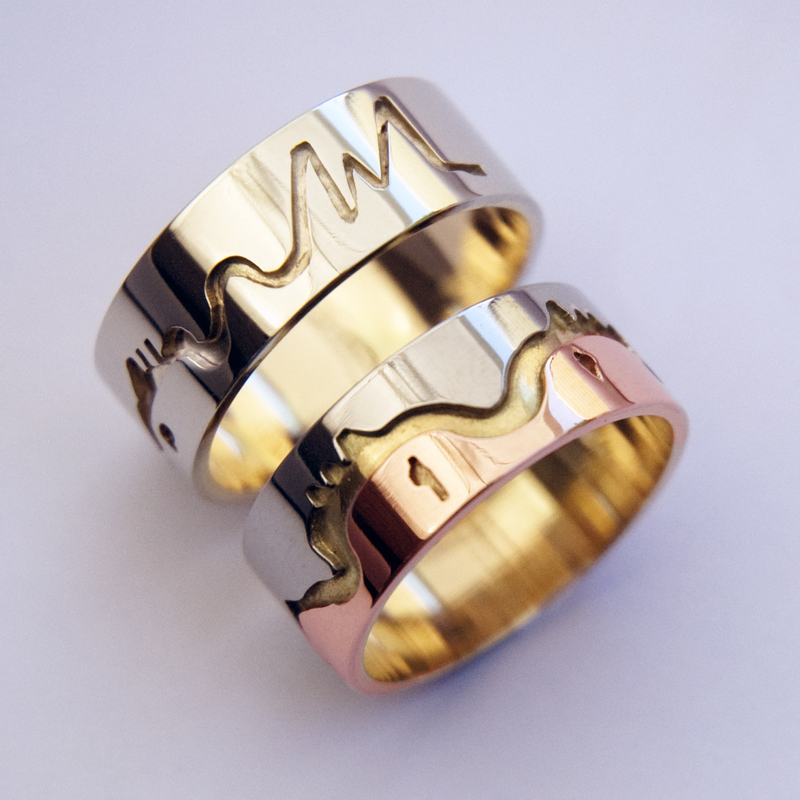 The stylized heartbeat designs in the rings symbolize the heartbeat of our mother the Earth, and at the same time the heartbeat of both life partners and all creatures with which they find themselves surrounded; a combined sound of countless hearts filling the Universe, each pulsing at its own speed, but each a part of the whole.